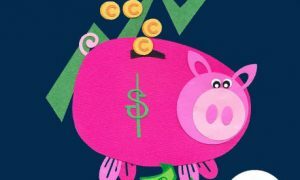 “Millions of Canadian investors are losing up to half of their retirement savings to decades of paying mutual fund fees. Most investors have no sense of the scale of this loss or its impact on their future well-being.” – Larry Bates, author, Beat The Bank. I’ve argued high money management fees will kill your portfolio for many years now – hence the reason to strongly consider these products here. Then again, I never knew this stuff for years – switching to lower cost investing solutions was a lesson I had to learn myself in my 20s. 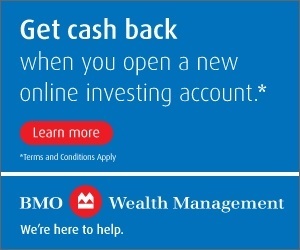 Going-forward, using my site and Beat The Bank, you have an opportunity to apply Simply Successful Investing practices far sooner than later. 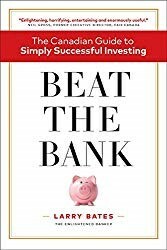 Banking industry veteran Larry Bates recently launched his new book, Beat the Bank: The Canadian Guide to Simply Successful Investing, and in that book he shares his advice to potentially double your long-term investing returns. Thanks to Larry, I received a couple copies of his book to giveaway below. Before I get to that however, here is some of his sage financial advice you should take to heart. Become a Do-It-Yourself (DIY) investor – via your own hand-picked mix of stocks, bonds and/or some ETFs. Follow Assemble-It-Yourself (AIY) investing – following a passive investing strategy using low-cost ETFs. Use a Robo-Advisor (robo-investing) – to support your low-cost investing plan. Wealth builders are amount, time and rate of return. Added together, more money, more time to compound/grow and higher returns of investment are ideal. Larry reminds us dividends are a big part of rates of return. Wealth killers are fees, taxation and inflation. Any one or more of these things are wealth destroyers you will need to fight as you work through your investing journey. You should always strive to avoid high priced products – since that’s less potential return for you. Taxation can be mitigated by “applying all savings first to TFSAs, RRSPs, or other tax-sheltered accounts” like RESPs. Given you have no influence on inflation whatsoever, you simply have to beat it via dividends, capital gains, interest income or all three. Invest accordingly! Old Bay Street portrays sales pitches as objective advice. Relative to lower cost alternatives, the investment products upon which Old Bay Street relies doom their clients to failure. By closest indexing, many mutual funds in Canada are purpose-built to fail. Canada is (unfortunately) a global leader in investment fraud. Old Bay Street is fighting to avoid the legal obligation to act in your best interest. Q: What is the most frustrating answer to any question? A: It depends! What will my annual retirement costs be? What size of a retirement nest egg will I need to cover those costs? 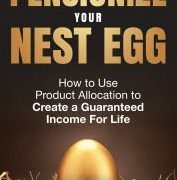 How much should I save to accumulate this nest egg via wealth builders and avoiding wealth killers? What are the ten commandments of Simply Successful Investing sprinkled throughout the book? Know Your “T-Rex Score” – essentially “Total Return Efficiency Index Score” or in layman’s terms – how much of your total investment return you keep after fees are accounted for. For example, assuming 6% rate of annual return, your T-Rex Score for a portfolio that costs 0.25% per year will be 90% after 40 years of investing. If you were to pay no fees at all, your T-Rex Score would be 100% regardless of your time horizon. A higher T-Rex Score is therefore better. Invest like clockwork – ideally – make all your savings for investment purposes automatic! “Reject complexity. Embrace simplicity.” Well said Larry and it’s also my hope investors that read and enjoy this blog also follow that advice that is well articulated in your book. Again, Larry was kind for deliver two (2) copies of Beat The Bank to giveaway to lucky readers on this site. Enter to win below. Good luck!! 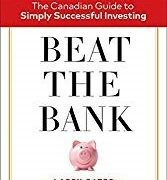 53 Responses to "Beat The Bank – Simply Successful Investing from Larry Bates"
ETF are the best investment and way to beat the banks. ETFs are a great way to invest ffsquares. Just as long as they are low-cost and diversified since not all ETFs are created equal. That’s a heck of great sounding book for those utilizing a bank or other advisor and investing in mutual funds, and I’m sure it will open some eyes. The diiference fees make on long term results is staggering. I don’t like that it won’t help my bank stocks though! Ah, but maybe it will with higher assets under management – the more banks have the more they can lend out! Can’t get the “Leave a blog post comment” working to enter?? Could be me. This is so true. A calculation using 6.81% TSX returns average from last 30 years… Using DIY investing, your returns per $100,000 : $675,687. With advisor, fees etc. equaling 2%, your left with: $398,005. Difference is: $277,682. Paul, he goes through those examples in the book. It will be mind-blowing for folks paying 2% MERs sadly. Comments working on my end. Anything you need to post? Can not agree with #9. One can only control one of these (taxes to some degree), but why are Low Fees acceptable, why not No Fees? Want to beat the bank, own the bank stocks, not their products. 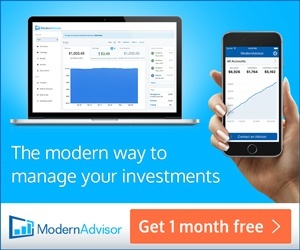 I’m glad to see he’s not overly doctrinaire about his recommendations, encouraging DIY, AIY and robo-advisor options. I would like to get the book to either confirm or challenge (or both) some of the opinions I’ve developed concerning investing over the years. That’s what I liked Russ. He’s not one of these “index investing or you’re stupid” investor advocates. His approach seems very balanced. Looks like a good read. I’m always looking for ways to “save” money. I’ve just recently put some money into GICs through a deposit broker. No fees (that are obvious to me, anyway) and higher GIC rates than the banks. Here’s my 10 commandments for Simple Investing. 9. Don’t worry about diversification, asset allocation or re-balancing. Own a few of best, not the most. I’m not into “commandments”. More of a ‘Barbossa pirate’s code’ kind of guy, and even then, personal situations may require deviations and adjustments. Yeah, I agree. I’ll survive. Recognize that each individual person should study, learn and think before developing their own set of “commandments” to meet their own unique personal needs, goals, risk tolerance, and likelihood of staying the course etc. There is no one single “best” way to invest and save to do that. @RBull: Agree, but I just stated mine and asked others to share theirs. Fair point Cannew. It’s obvious yours are working well for you. @RBull: Looking at my numbers some might say not that well. For the 12 stocks I hold they are down almost $200k since Dec 2017. If I cared about Total Return I’d be panicking as I’m down YTD. On the other hand my Income is up $9,200 since Dec. and I expect more before yearend, so I’m happy. Others may have done better overall, but as you’ve said we each have our own standards. @RBull: Getting old, looked at the wrong numbers, but I’m still down $150k. Income is correct. Cannew, if I understand correctly your goal and focus is solely to increase your income from investments, which already seems to way exceed your needs and spending. To that end you are hugely successful, and a model for many which I think you are to be commended highly for. Continued best wishes. As you know you we are taking a different approach with more diversification and different asset classes, and a desire to not leave behind significant unspent assets. My main goal is to maintain a strong steady income base (with some growth to account for inflation), which is actually higher in retirement (4.5 yrs) than what we’re spending so far. On the total return side our “hope” and plan is that over longer time equity assets will grow at ~half of historical norms- 3.5% nominal and FI return @ 1.8%. “If” it does we can spend considerably more if desired or just adjust lifestyle up/down based on whatever markets arrive at. Have yet to be “down” in retirement but I know its coming and I fully expect we could have a 50% equity haircut so I’d be down ~30% assets (probably temporarily) but my base income shouldn’t be too negatively affected, and even if it was we could ride it out for many years with dividends/distributions/interest FI to tap, work pension, cash etc., and/or simply cut back discretionary spending- to date about 35% overall spend is on travel. This is why I don’t think I’ll find the need to panic with my total return approach. Been through a few big ones before with 100% equities. Others may well do better but we’re pretty comfortable and content so far and where we think we’re headed. Not stated as commandments but just a high level look at our strategy. @RBull: Nothing wrong with different approaches to achieve ones goal. You’ve done well and life will be even easier when cpp and oas kick in. We don’t have a pension either so that’s why we concentrated on the Income. I do wish we’d kept our US stocks in our RRIF, but we did manage to buy more of our Cdn holdings at a good yields. I know that as long as the Income grows capital will follow eventually. I wish I had the commandments when I first started, or even a clear plan. It took us many years of Ups & Downs before we found our path. I can relate to the ups and downs and years of hard knocks to get on a better path. When you and I were getting started and for many years after it was a LOT harder to find investing information, let alone do it on our own, and there are an incredible amount of options and resources now. I respect you’re very pleased to have settled on something that has made a huge difference/improvement. We’re far from perfect on our path but should have more rights than wrongs now and be effective enough to enjoy our retirement. We’ve seen huge swings in our income over the years (earning now~half of our better years but doing fine.) We’re adaptable and thankful to be here. Fair point. The best financial advice (or life advice for that matter) is to likely use what’s between your own ears! Very fair Lloyd – everyone’s situation is unique and personal. Humm…need to think about those a bit friend but I like Larry’s overall. 1. Make savings automatic, including savings for investment purposes. 2. Invest in quality dividend paying stocks (for income) and low-cost ETFs (for growth) to get the best from both dividend and index investing worlds. 3. Maximize contributions to all tax-free and tax-deferred accounts (i.e., TFSA, RRSP, RESP, etc.) before investing in a taxable account. 4. Reinvest all dividends and distributions paid to take advantage of the power of compounding. 5. Rinse and repeat #1-4 until wealthy. Didn’t read it (yet!) but does Larry propose model portfolios? How does he pick stock to own and forget? Is he a proponent of dividend investing? Wish this book was published when I was starting out in the investing world. I had to learn most of these points the hard way. Owning shares in some of the banks means I benefitted from the bank practices though. I agree with Cannew except for the second #9 about diversification. Would love to receive the book. Then ENB is out! NOT! @Mike: I don’t consider ENB a high yield stock, just one that the market sees as not attractive because of its debt or whatever. I’d love to have purchased a lot more but I’m fully invested. I hear ya on ENB. Looking for new investments as well since I don’t want to be overweight or >5% in any one stock or ETF. The simpler the investment process, the easier it will be to keep on track. Can it go much lower? Who knows! Very beaten up. I guess investors don’t like lower operating cash flow over time and have sold. Yes, does seem to be struggling some for years comparitively and the last press release on sept 13 was very ominous sounding. Div growth is outstanding though, payout low, highest rated credit utility. RE ENF they have a good FAQ re ENB takeover on their site. I would be very interested in reading this book. I started seriously investing late in life in my high forties so am playing catch up. Hurt in a work accident , major loss of income for the rest of my life…been digging my heels in and have approximately with my house $650,000. I am now 55 and have a long ways to go for financial freedom. I personally liked his #10 🙂 enjoy life !! My friend suddenly died at age of 56. I talked to him two weeks before and there was no sign of anything wrong. You never know what will happen to you tomorrow. So yes enjoy life while you can. Wow, great message for us all May. Sorry to read that May. Indeed, a reminder to us all to live life fully and appreciate every day. Sorry to hear of your friend. 56 is very young and I hope his/her family are fine. I’d like to learn about his stories from the inside, I’m sure none will surprise most here but it adds to the pile of “buyer beware” stories. I like when Canadian authors write about finance from a Canadian perspective. I really enjoyed The Wealthy Barber Returns. It is true that someone often has a hand in our money pockets. Those fees are very insidious indeed. I enjoy reading all the comments. I prefer index ETF’s since I simply do nothing. I recognize each person is wired differently. The less I think of my equity holdings, the better. Nothing wrong with indexed ETFs. Larry makes a case for that in the book. “I’ve been telling this story to family and friends. This book will give me more facts and figures to relay. 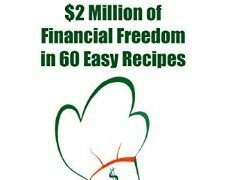 I want to win because…I’m starting out later than I would’ve liked to on this financial journey and need all the help I can get! This blog has been such a great source of information for me so thank you. I want to win, because I want to follow assemble-it-yourself investing.